While Disney is the #1 family vacation destination in the world it also attracts millions of young and young-at-heart couples every year. If you are like me and feel like every vacation with your beau is like another honeymoon try some of my favorite photo spots! 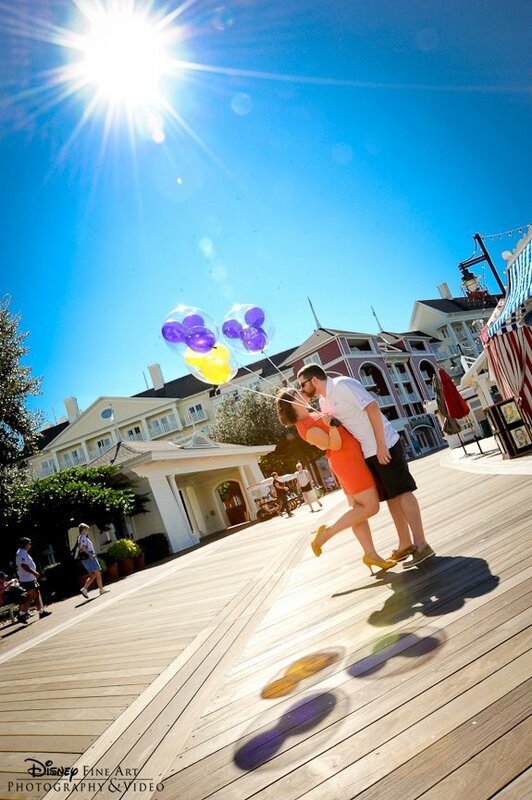 Consider starting your day with a breakfast at an in-park restaurant before a park opens to grab some solo pictures with your love! You will be allowed to get into your first park before the crowds AND take some pictures while its empty! That alone will make your pictures unique! I think Epcot’s World Showcase is also often overlooked. There are tons of getaways within pavilions such as: inside the Mexico pavilion in the marketplace atmosphere, the bridge in Italy, the gardens in UK or Japan, near the St. George fountain in Germany or even in some of the shops! Just spending an hour walking through World Showcase will prove to be a great choice. Since you will be right near international gateway the Boardwalk would be a fabulous spot for pictures! Not just outside but in the hotel as well! They retro theme inside is fabulous and there is a great porch near the lobby where you could nab pictures looking out onto the Boardwalk. The bar has some great vintage radios too! If you prefer the theming of Beach & Yacht Club they are another great option! Also the Magic Kingdom would be most romantic in the last afternoon/evening. Getting some shots around the castle at dusk would be really beautiful and even getting shots at night are fabulous. Also, don’t forget to get some candid pics on the teacups and the carousel!! One of my favorite pictures my husband and I have ever taken in Disney World is a castle shot of us at night on the Tomorrowland bridge that a Photopass photog took! Don't underestimate the beauty of ALL the parks at night!